several updated walking tours along Cahuenga and Cosmo, where Keaton filmed eight different movies, and a new tour around the Keaton Studio site. You can download the updated Hollywood tour PDF here. Hollywood’s Silent Echoes Cahuenga Tour 2018. 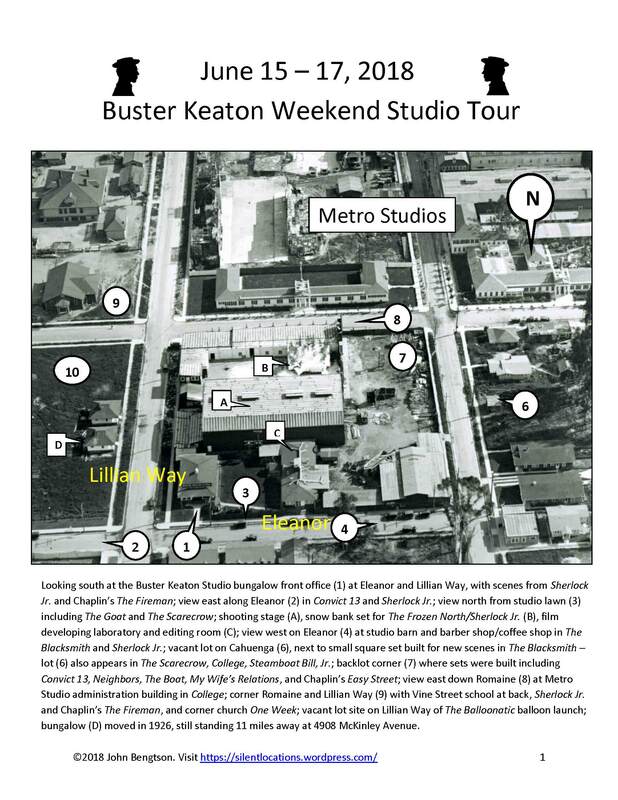 Here is the new PDF tour of Keaton’s studio site. BK Weekend Studio Tour Guide 2018 – Bengtson. Below is a nicely edited video of one of the Keaton studio tours, posted by Ken Mitchroney, covering many sites on the PDF tour – thank you so much Ken. 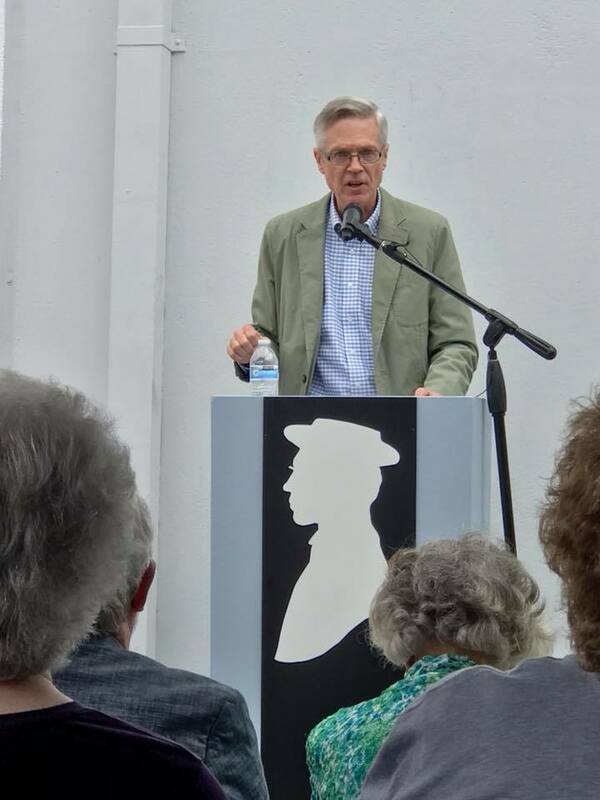 Many people worked very long and hard to make this weekend such a success, including Alek Lev, Bob Borgen, Patty Tobias, Beth Pedersen, and Vicki Smith, all officers of the International Buster Keaton Society. I also want to thank the volunteers who assisted with my tours, Binnie Brennan, Connie Sanocki, and Charlie Pecoraro. Thanks also to Quixote Studios, the site of the former Keaton Studio, that graciously supplied the chairs, tables, shade tents, and related equipment for the dedication ceremony. If any readers participated on either tour, and took some photos they can share, I would very much appreciate hearing from you. “Buster Keaton knew the streets of LA like the back of his hand. He’d travel everywhere to find just the right setting for a joke, and he often matched scenes that were filmed miles apart. Though he was particular as a filmmaker, he was also pragmatic. As some of you have already seen today, he conveniently filmed dozens of scenes right here in his home studio neighborhood. There are echoes of Buster everywhere you look. Right at this corner, Buster walked into a street sign, knocking himself down, in Convict 13. He crossed the street here following Ward Crane in Sherlock Jr. And while doing a stunt for another actor, in Sherlock Jr. he also fell off the back of a motorcycle right in this intersection behind you. And let’s not forget that over 100 years ago Charlie Chaplin spent perhaps the happiest years of his career filming 12 comedy shorts for the Mutual Company, right here at the same studio. So in this same intersection behind you, Charlie and a group of firemen once chased each other making The Fireman in 1916. Hollywood was still an agricultural community when the studio was built here in 1914. The former Cahuenga Valley Lemon Growers warehouse stood right across the street. 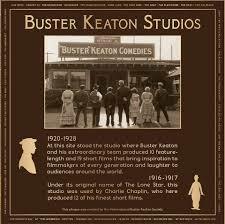 You can actually see stacks of lemon crates appearing in a couple of Buster’s early films. Can you imagine, Buster inhaled the fragrance of lemons while working here! Keaton liked to film close to home. He filmed three movies a block over from here at Santa Monica and Vine. And just a bit further north, Keaton filmed scenes for EIGHT different movies on just one block of Cahuenga. As some of you saw this morning, there remains there an alley where Chaplin filmed The Kid, Keaton filmed Cops, and Harold Lloyd filmed Safety Last! So at this one alley, the Three Kings of Silent Comedy each filmed an iconic masterpiece, each movie has been inducted into the National Film Registry of the Library of Congress – and you can still visit this alley today. So perhaps someday, with your support, this alley will be recognized as a Los Angeles Historic Cultural Monument. This entry was posted in Buster Keaton, Chaplin Studio, Charlie Chaplin, Keaton Studio. Bookmark the permalink.